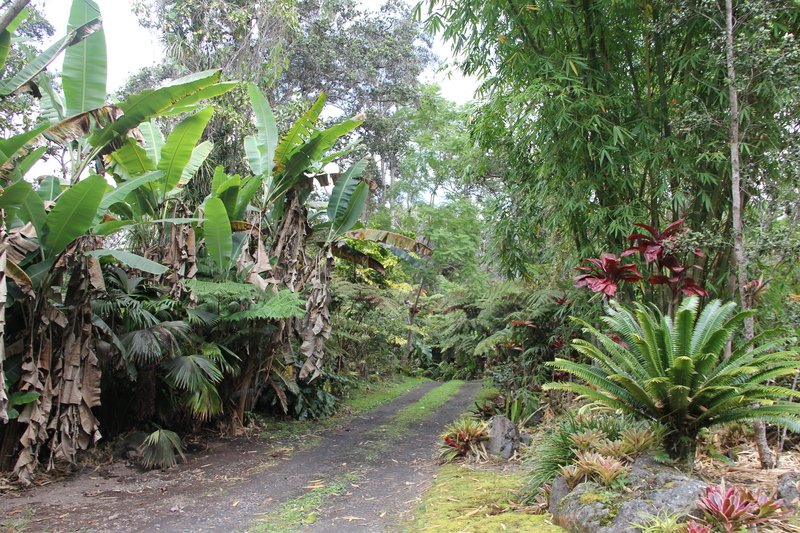 Last September I moved from Alii Drive along the shore in Kailua-Kona, island of Hawaii to Kaloko Drive and into the cloud forest. 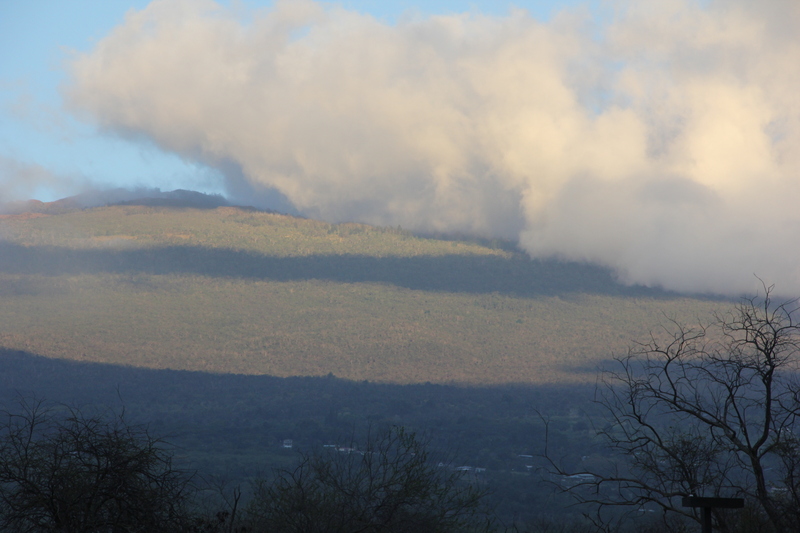 I often hiked on the mountain there and was excited to experience living in that environment. Unfortunately there was no internet connection unless I purchased a satellite dish with a long term contract. For the past seven months I have continued to write and post by visiting friends but have not had a chance to upload many photos. I’d like to show you a few photos now of the neighborhood where I spent the winter. 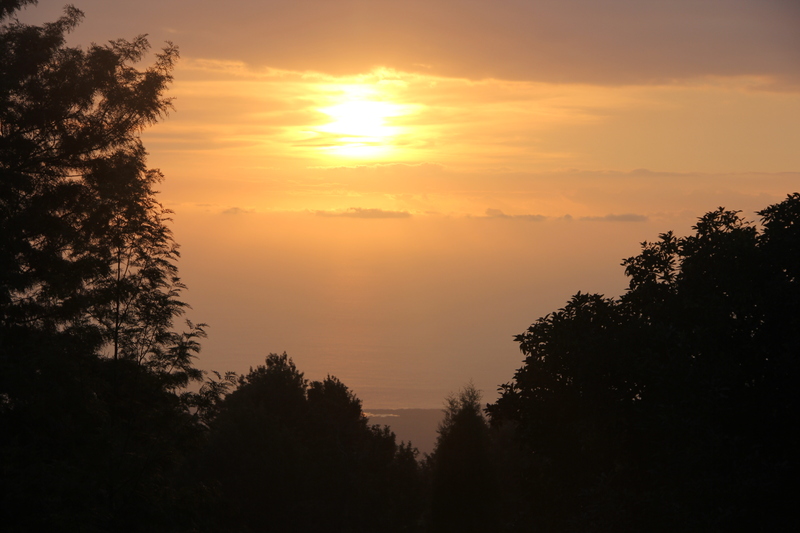 One evening out for a stroll at the time of the Hunter’s Moon there was a spot where I could look makai (towards the ocean) to see the setting sun and turning mauka (towards the mountain) catch the rising moon. 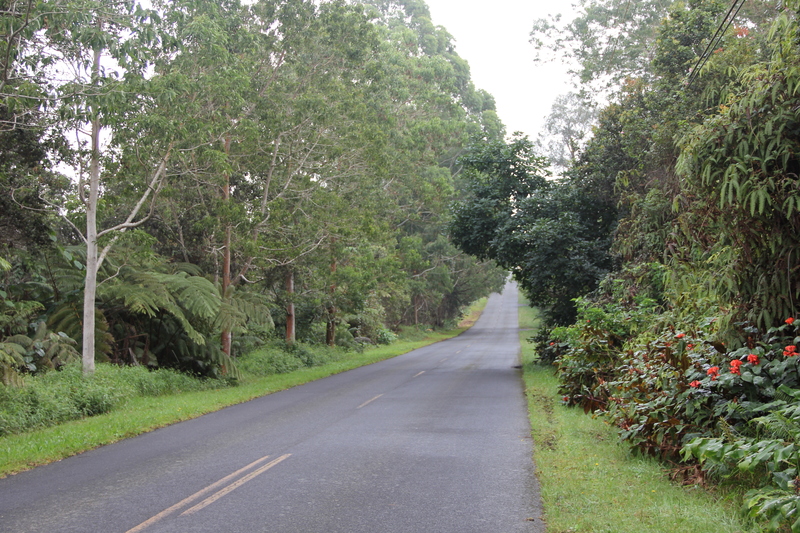 Kaloko Drive is a well paved road that climbs from 1000′ elevation to about 5,000′ where it ends several thousand feet below the peak of Hualalai volcano. There is no other road like this in town with the wide shoulders of neatly trimmed grass and all of the houses set back, mostly out of sight. 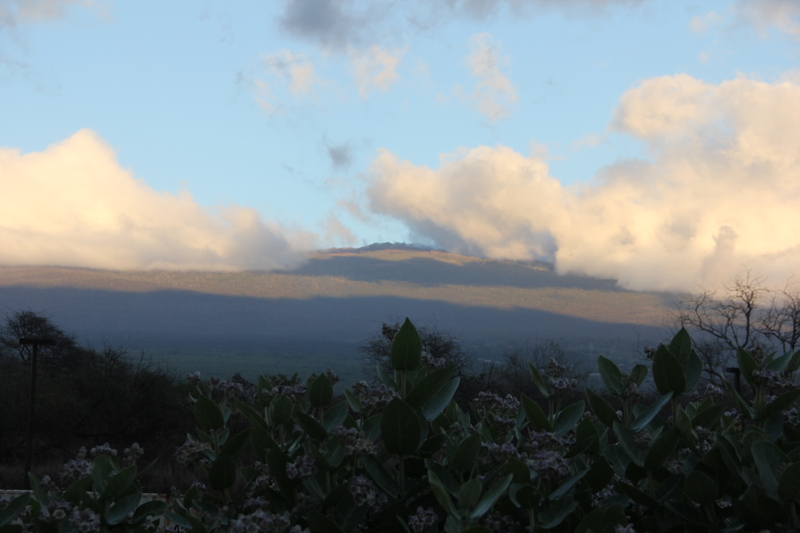 It is also the only direct route into the cloud forest above Kona. 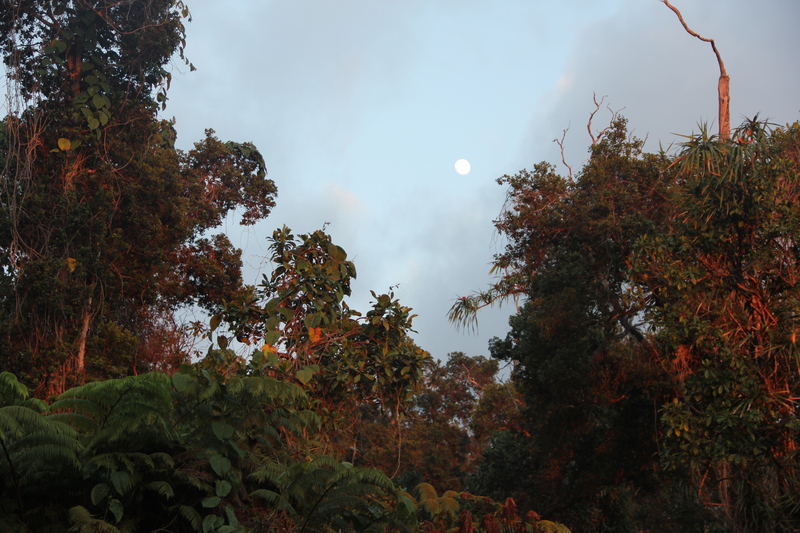 My place was 2 1/2 miles up the road at 2,500′ above sea level. Peace and quiet. Not much to look at from the outside but the place is three years new and spacious with fourteen foot high ceilings. The only traffic is the owner who lives just beyond. Dogs bark, birds sing, peace and quiet. From out the kitchen window the view is a reminder that the space where the house sits is carved out of the primeval forest. 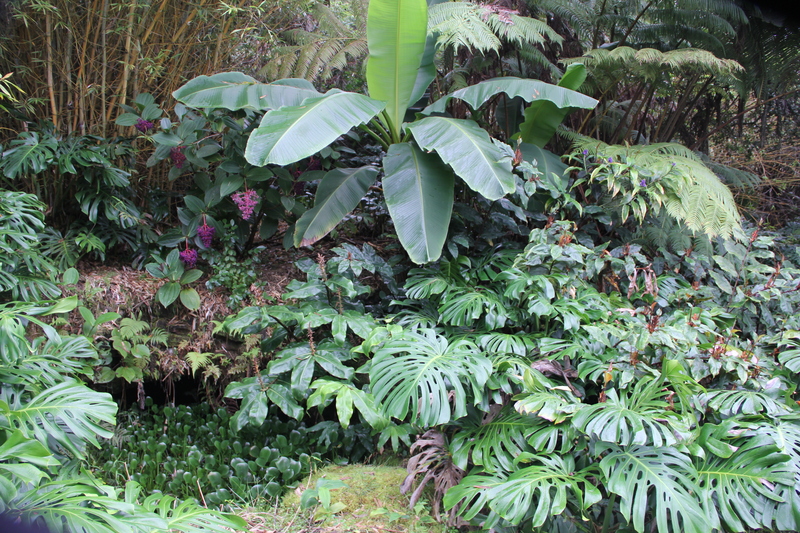 There is no manicured lawn here, just ohia trees, hapu fern and taro plants. 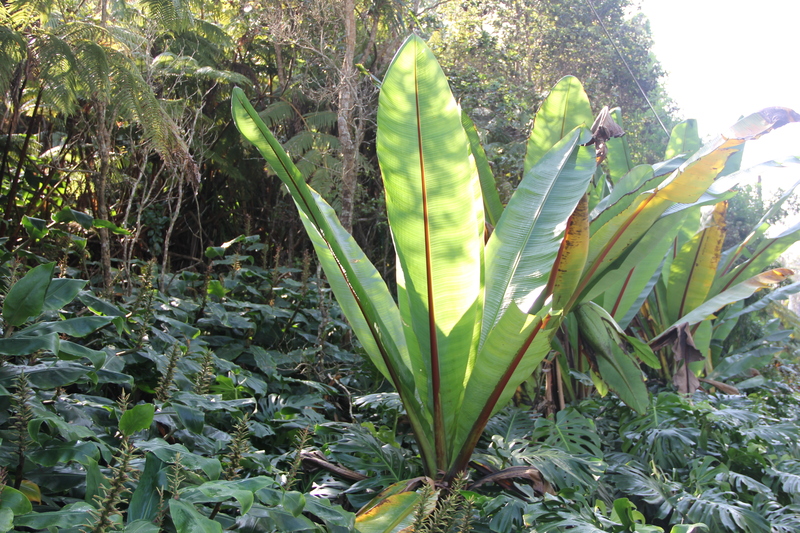 There are trails that make for enjoyable hikes but most of the time a walk up (or down) the road is enough to exercise the legs, still the mind and absorb the beauty of nature……bamboo, wild bananas, ginger, ti, hapu, monstera and a whole jungle of plants that I can’t name grow along the roadside. Mornings were generally nice but chilly. Temperature at 7:00 am was often 50 degrees F. No chance of snow but cold enough leaving for work in short pants and bare legs. The sun would top the trees about 9:00 but by 11:00 o’clock the sky would often turn grey. Clouds roll in nearly every afternoon and scrape and swirl amongst the trees. In winter there is not much rain but the moisture and dampness is there just the same. My furniture started to grow a green mold, food would get spoiled and any papers went limp. The clothes in the closet had a distinct musty smell, the pillows and cushions were not doing well. 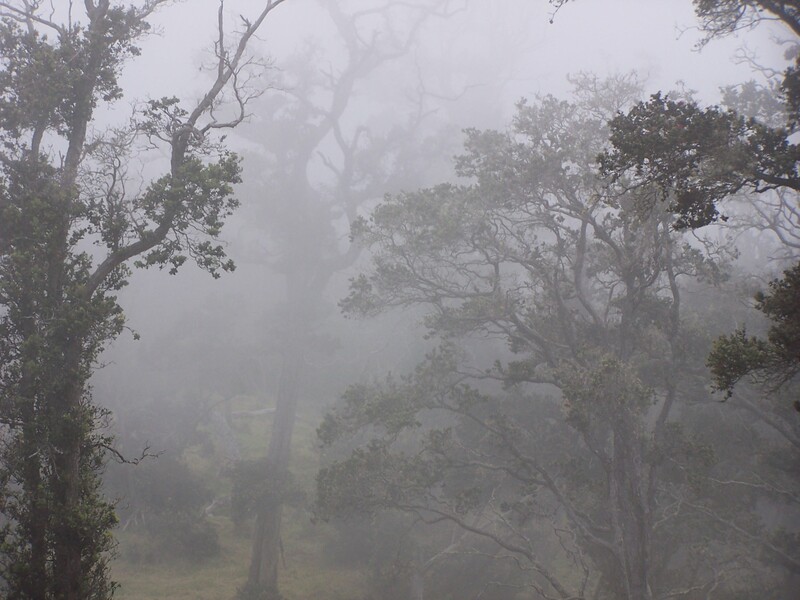 So much for living in the cloud forest I decided. The situation with mold was not a healthy one to sustain over time. Time to move again. Hualālai (pronounced [huwəˈlaːlɐi] in Hawaiian) is a dormant shield volcano on the island of Hawaiʻi in the Hawaiian Islands. It is the third-youngest and the third most active of the five volcanoes that form the island of Hawaiʻi, following Kīlauea and the much larger Mauna Loa, and also the westernmost. Its peak is 8,271 feet (2,521 m) above sea level. 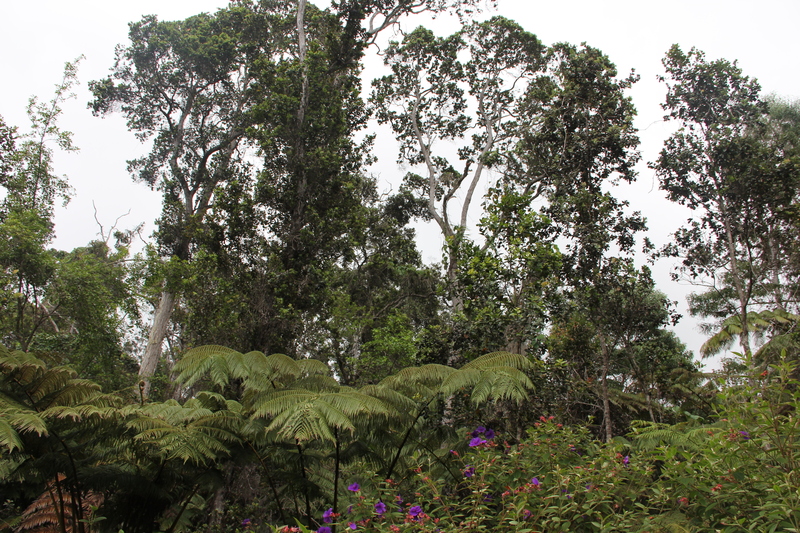 Hualālai is estimated to have risen above sea level about 300,000 years ago. Despite maintaining a very low level of activity since its last eruption in 1801, Hualālai is still considered active, and is expected to erupt again some time within the next century. The relative unpreparedness of the residents in the area caused by the lull in activity would worsen the consequences of such an event. Now I’m living at a lower elevation. 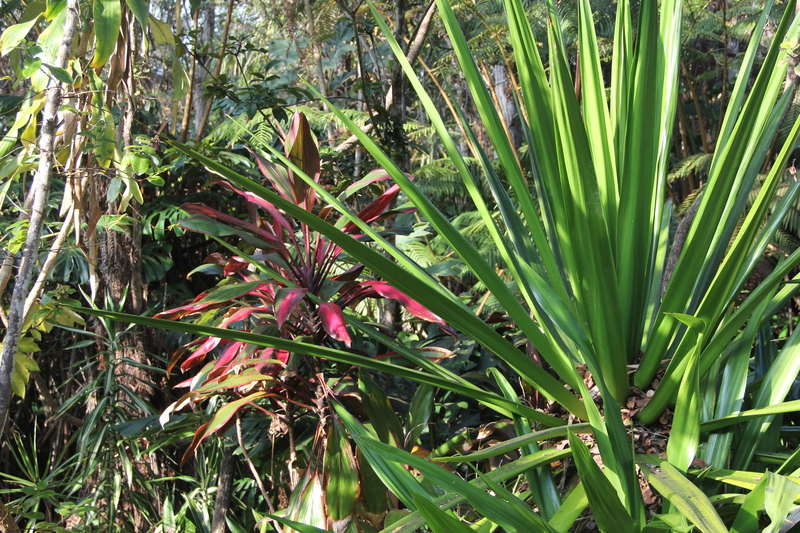 Somewhere around 1,200 foot elevation just outside of the town of Holualoa in coffee growing country. I’ll send you some pictures of the new neighborhood soon. P.S. there is internet at the new place and I look forward to catching up on reading your ideas, thoughts and tales of adventure from the comfort of home. Peace. 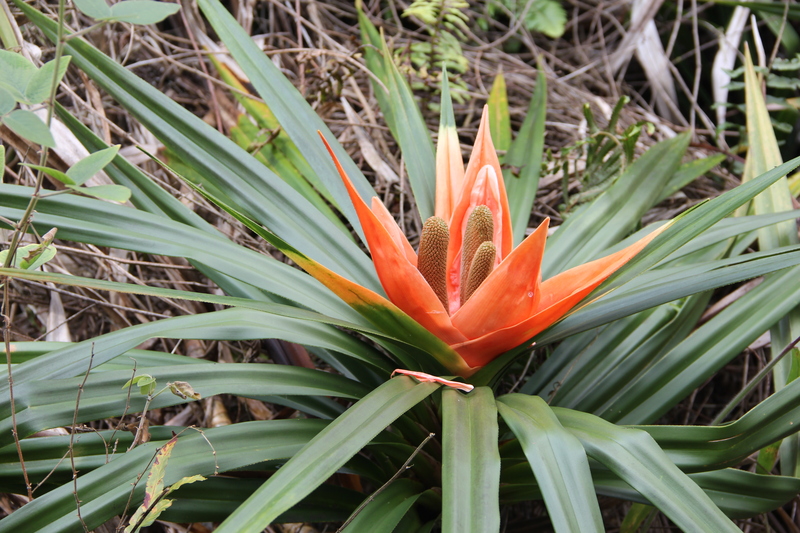 This entry was posted in earth, environment, Nature and tagged environment, flora, Hawaii, nature, photography. Bookmark the permalink. 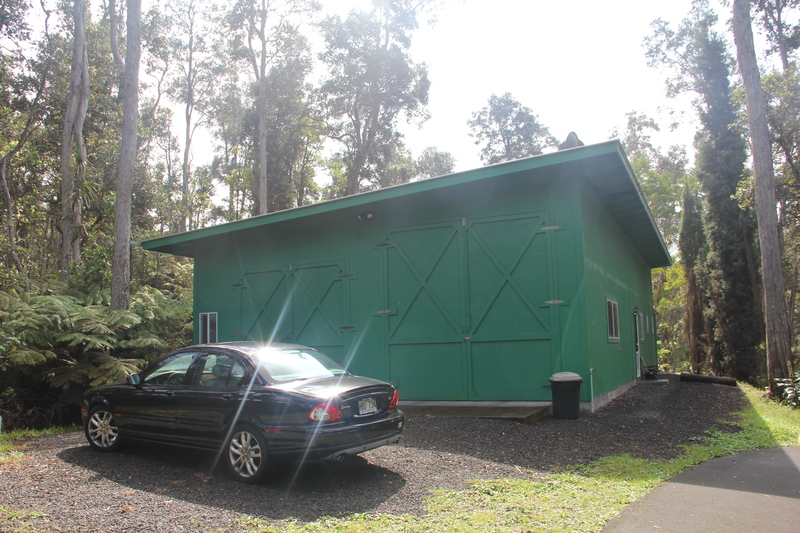 Interesting to read about what it’s like to live “upcountry”. That’s a spectacular place, Dohn. One of the best things about blogging is you get to look out of other people’s kitchen windows on the other side of the world. or take a walk around London. It amazes me still the folks who stop by from every corner of the planet. There is also a responsibility that goes with that. Thanks. There are two types of vacation in my mind. One would be to relax and treat oneself to a bit of indulgence, the second is when traveling to explore the history, environment and culture of a place. Gorgeous photos. Having lived in temperate rainforest on the California coast, I share your distaste for the creeping mold and dampness of the winter months – hard to keep furniture and clothes dry, and you can’t leave the place alone for more than a few days before the inside vegetation starts to take over. My first visit and fun taste of Hawaii…very nice. Glad you enjoyed. More to come on exploring the Big Island. I’ve never once had the urge to visit Hawaii – maybe I need to rethink that …. Beautiful photos. What an experience. I really love the gray moist-filled air with the trees. It reminds me of the Oregon coast. And yay to coffee! Dohn, this was a treat to see and read. What special places you have inhabited. 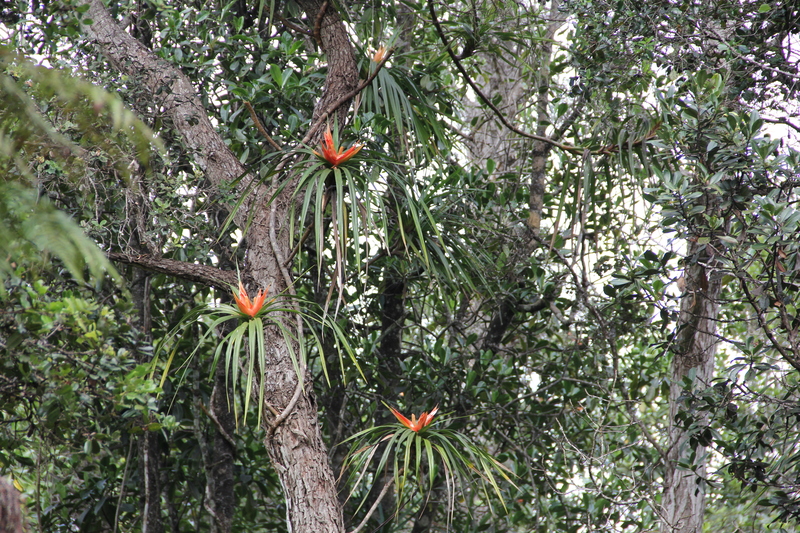 The only places I have ever seen bromeliads in abundance are the National Gallery of Canada (where an entire inner courtyard is populated with them) and local shopping centres (as you know we spend much of the winter held hostage indoors), so it was gorgeous to see so many in a natural setting in these pictdures! The green mold most have been things a little too interesting, hope you are really enjoying your latest digs. Can’t wait to see more pictures. Yes indeed. Not to say I wasn’t thinking about folks living in the snow and cold, but my thinking was how lucky am I. So green and lush and such a contrast to the dry we are experiencing here in Colorado. Lovely! Thanks for such beautiful photos. I have this romantic daydream of living in the middle of nowhere right in amongst nature, but I know that I would struggle to do so in reality. All the best with making a new home. Fact is it was only 7 miles to work and near the ocean. That was special. 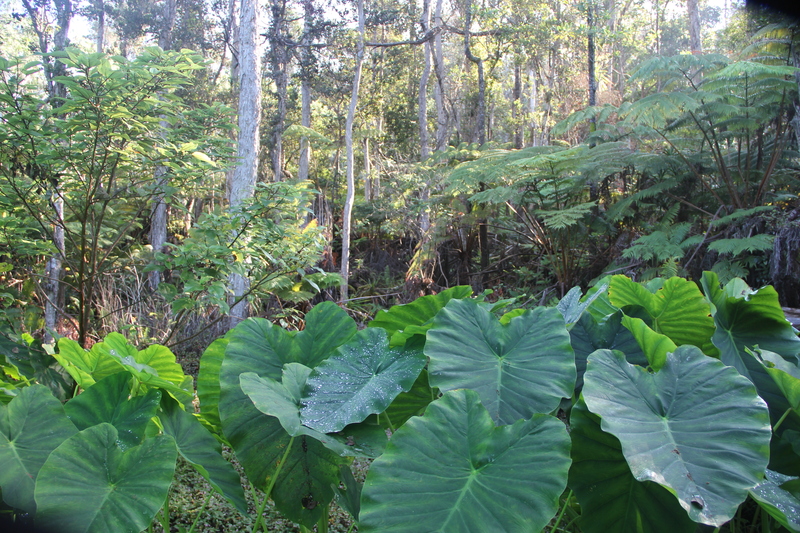 It’s a beautiful place – so much lush vegetation. Thanks for sharing all those pictures of the plant life and countryside – quite magical. Maybe not too healthy to live up there for long though. Look forward to seeing something of the area you are now inhabiting. Thanks Cathy. 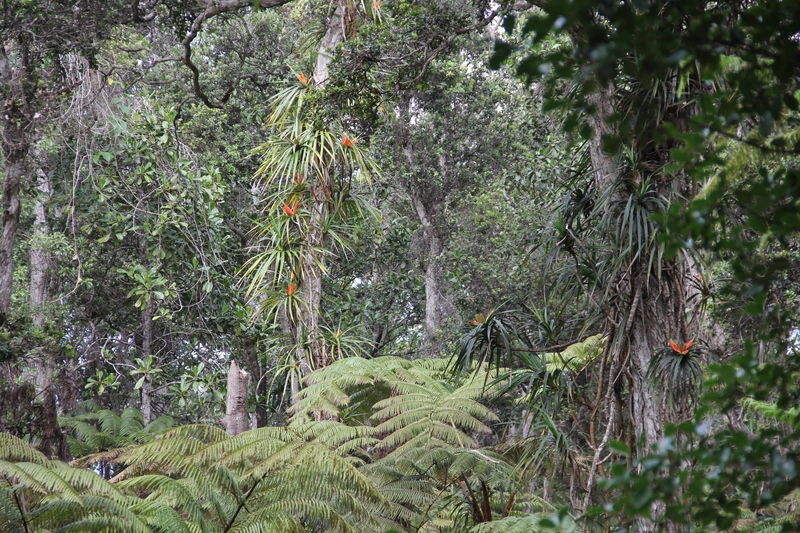 The new place (in the country) has breadfruit, bananas, lemons, and macadamia nuts and a spectacular view. Ha Ha, I do see quite a few of those tourist types waddling about. We try and send them home with aloha in their hearts.